Loggerhead turtles (Caretta caretta) are marine creatures who can be found in almost all tropical and temperate oceans across the globe. Despite this wide distribution, their numbers are declining, and the International Union for Conservation of Nature lists them as endangered. The drop in numbers is mostly due to human disturbance, but several adaptations help them survive in their natural habitat. Loggerheads need to drink, but as a sea turtle, only salt water is available to them. However, their bodies have a way of overcoming this problem. Loggerheads have special salt glands near their eyes that can excrete high concentrations of salt. Therefore, they're able to drink salty sea water without dehydrating or becoming sick. When excreting the excess salt, it looks as though these turtles are crying. People witnessing female loggerhead turtles nesting have often said they're weeping for their young, when really they're just getting rid of salt from their bodies. 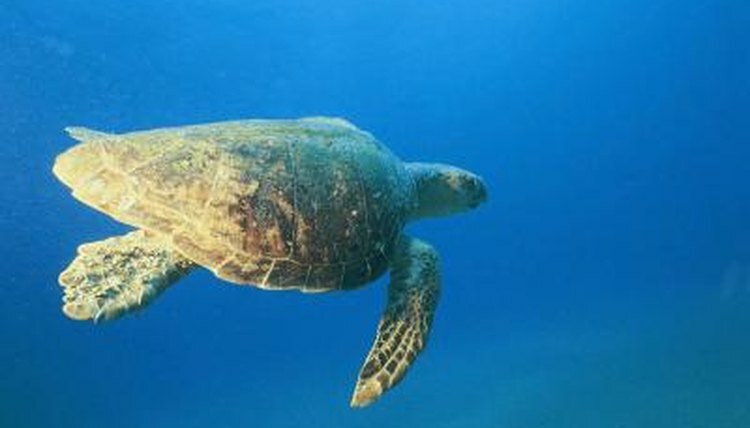 The large, strong and paddle-like flippers that loggerhead turtles possess allow them to swim deftly through the ocean. They're also extremely adept at diving. As reptiles, they need to breathe oxygen from the surface, but these turtles can dive for up to 20 minutes without taking a breath. If resting, they can go without breathing for a number of hours. They can do this by moving blood away from areas that are more tolerant of low oxygen levels and redirecting it to more vital areas like the heart, brain and central nervous system. Although primarily carnivores, loggerhead turtles have adapted to become generalized eaters, which means they're always likely to find something to eat for dinner. In addition to a range of sea creatures, these turtles will also eat algae and other plant matter, if necessary. Loggerheads can also prey on species that others can't crack. Hard-shelled creatures -- barnacles, whelks and horseshoe crabs -- don't stand a chance against their large, powerful jaws. Since loggerhead turtles are the largest of all hard-shelled sea turtles, reaching 30 to 40 inches long and up to 250 pounds, their size alone is usually enough to avoid predation. Although they can't retract head and limbs into their shell as land-dwelling turtles can, this hard appendage -- plus the scaly skin on their heads and necks -- still offers them a lot of protection from predators who might otherwise be tempted to attack. How Do the Florida Crocodiles Get Their Food?